Luis Alberto Urrea, May 2009. This delightful novel about a road trip that’s alternately painful, amazing, and eye-opening veers close to magical realism but never quite crosses that line. The small Mexican town of Tres Camarones has lost most of its men to America’s promise of seasonal employment, so there’s no one around to protect the village from drug hustlers and others with malicious intent. Three of its teenage girls, accompanied by local gay bartender Tacho, go on a mission across the American border to try to bring back some likely guys. Peripheral missions include looking for Nayeli’s deadbeat dad, trying to find a friend in San Diego, and rescuing Tacho from jail when he’s locked up at the border crossing. Along the way, they pick up some interesting characters and, of course, do the whole coming-of-age thing. Urrea’s ear for dialogue and attention to the details of color and flavor lift this novel up from an otherwise-certain fate of being just another border-crossing story or just another bildungsroman. Note “Sure enough, the she-crab had a thick girdle of eggs plastered to her shell. Tacho would be delighted. Crab roe made a paste that moved him to orgasmic delight when he smeared it on a tortilla and soaked it in lemon juice and green salsa,” or “[The wall] was covered in bright paint — an American flag, coffins full of skeletons, words, poems, a white dove. They stared at it, reading the graffiti. ‘Someone doesn’t like George Bush,’ Tacho noted.” There’s just enough Spanish sprinkled through the book to give it a foreign flavor, yet the cultural references are to Eminem, Boy Scouts, and the Grinch. Urrea has succeeded in painting a picture of a beautiful and ugly, wild and grounded, local and foreign Tijuana and San Diego. Highly recommended. 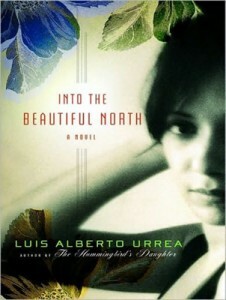 This entry was posted in 2009, gay male, gay-bashing, latina/o, Luis Alberto Urrea, queer adult, realistic. Bookmark the permalink.